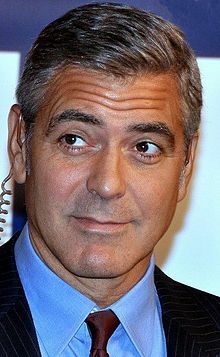 George Timothy Clooney (born May 6, 1961) is an American actor, film director, producer, and screenwriter. He has received three Golden Globe Awards for his work as an actor and two Academy Awards—one for acting and the other for producing. Clooney is also noted for his political activism and has served as one of the United Nations Messengers of Peace since January 31, 2008. Clooney made his acting debut on television in 1978, and later gained wide recognition in his role as Dr. Douglas “Doug” Ross on the long-running medical drama ER from 1994 to 1999, for which he received two Emmy Award nominations. While working on ER, he began attracting a variety of leading roles in films, including Batman & Robin (1997) and Out of Sight (1998), in which he first worked with long-term collaborator Steven Soderbergh. In 1999 Clooney took the lead role in Three Kings, a well-received war satire set during the Gulf War. In 2001, Clooney’s fame widened with the release of his biggest commercial success, Ocean’s Eleven, the first of a profitable film trilogy, a remake of the 1960 film which starred members of the Rat Pack with Frank Sinatra as Danny Ocean. He made his directorial debut a year later with the 2002 biographical thriller Confessions of a Dangerous Mind, and has since directed Good Night, and Good Luck (2005), Leatherheads (2008), and The Ides of March (2011). He won an Academy Award for Best Supporting Actor for his role in the Middle East thriller Syriana (2005) and subsequently gained Best Actor nominations for such films as Michael Clayton (2007), Up in the Air (2009) and The Descendants (2011). In 2013, he received the Academy Award for Best Picture for producing the film Argo, alongside Ben Affleck and Grant Heslov. He is the only person ever to be nominated for Academy Awards in six different categories. In 2005, TV Guide ranked Clooney #1 on its “50 Sexiest Stars of All Time” lists. Clooney’s humanitarian work includes his advocacy of finding a resolution for the Darfur conflict, raising funds for the 2010 Haiti earthquake, 2004 Tsunami, and 9/11 victims, and creating documentaries such as Sand and Sorrow to raise awareness about international crises. He is also a member of the Council on Foreign Relations. Ferdia McAnna (writer): George Clooney was great in Out of sight and those Killer Tomato b movies. Michael Purcell (actor): I also think George Clooney is a very smart businessman but I’m not crazy about his acting. I hated The Descendants and couldn’t understand why it or he was nominated for the Academy Award last year. Tommy O’Neill (actor): He’s great. Gemma Doorley (actress): I love them all except Clooney. Have never quite understood his appeal. I always think he is very self conscious on screen. Michael Doherty (RTE Guide): Better director than actor but the first true Movie Star Hollywood has produced since Clark Gable. Alvean Jones (tv presenter): Overrated. Film fan: Rise from soapy tv actor to film star has been quite remarkable. A wonderful actor with great charm. Highly ambitious but had not really faltered in his bid to be regarded as a serious actor. Sometimes wobbles on the more emotionally demanding roles. As a light actor, the closest we get to a modern Cary Grant. Film fan: George Clooney – hot and liked him in E.R.